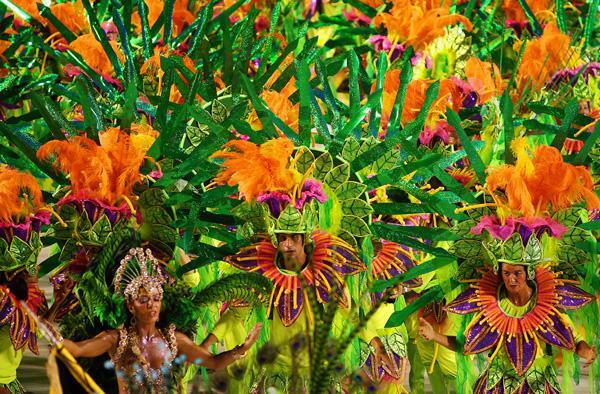 BRAZIL was not my original birthday week destination as the world-famous Carnival does not take place in September. New York City was. I dreamt of watching my first U.S Open match live and then a few days later, join in the commemoration of the 10th anniversary of the 9/11 mayhem. However, my strong drive to conquer the South American continent, the only continent I have not set foot barring Antarctica, changed my entire birthday travel plans. Posting on my Facebook wall that I would be spending my birthday week in Brazil, particularly Rio de Janeiro, spawned craze among friends whose must-visit list includes Rio. 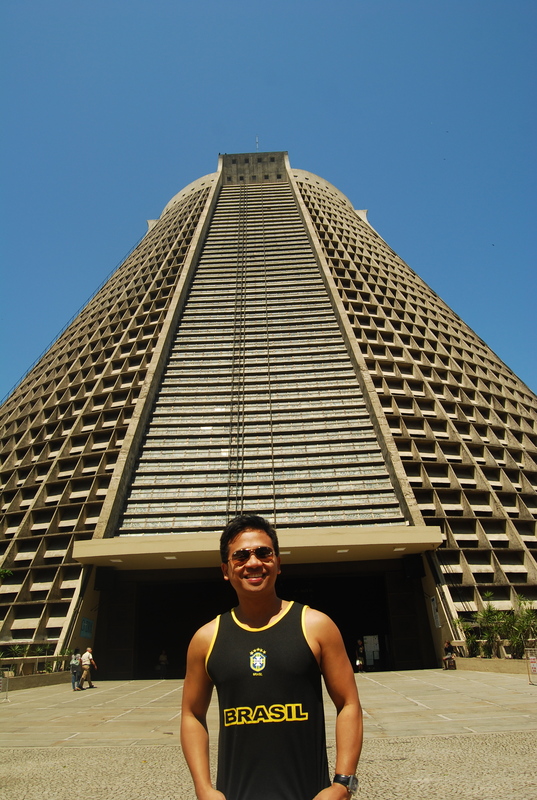 When you live in the Philippines, Brazil seems a far-fetched travel destination. The airfare can cost twice compared if you are coming directly from the U.S. or Europe, in addition to the travel time that varies from 25-33 hours (including layovers) depending on what airline you take and which city you are coming from. And so it remains a dream to most but for me I was absolutely resolute to realize that dream. Travel plans were immediately firmed up and my ticket was booked on an airline I personally selected, Korean Air. 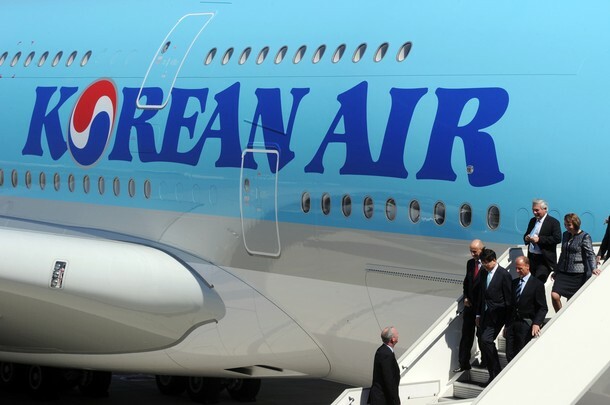 Why Korean Air? Firstly, I had this imperative personal urgency to fly on an Asian airline all the way to Brazil. Secondly, I would need to stop in the U.S. for a while on my way back from Brazil. Korean Air perfectly matched my two requirements as the layover would be in a U.S. city, unlike other Asian airlines that stop in European or Middle Eastern cities. Also Korean Air, Travel & Leisure’s #9 World’s Best Airline 2011, is the only airline that flies non-stop from Los Angeles to São Paulo. Yes, I put into use my U.S. visa needed to transit in a U.S. city. No, I didn’t need a visa to enter Brazil. 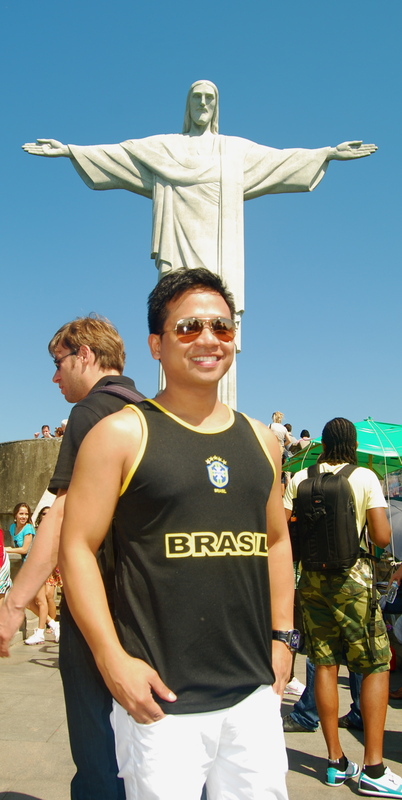 The Philippines is one of the countries whose citizens do not need a visa to enter Brazil. 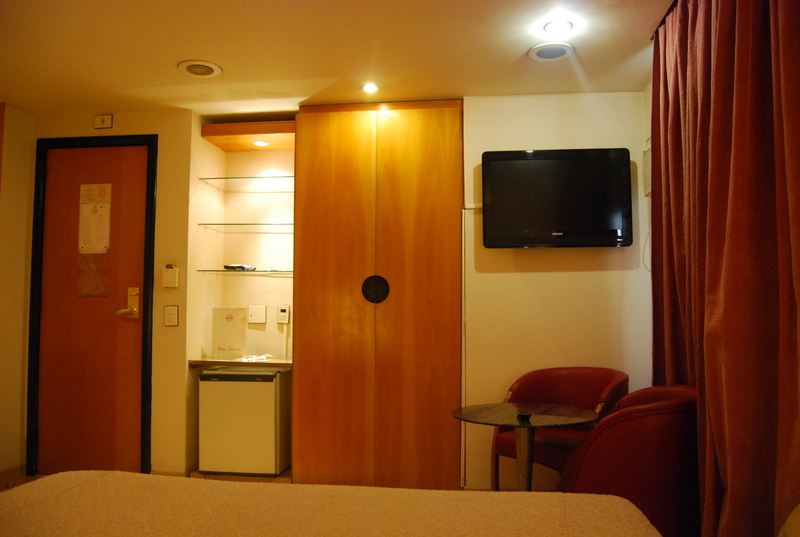 Upon arrival at the São Paulo airport after an almost 33 hours of plane rides and stopovers from Manila to Seoul to Los Angeles to São Paulo, I hied off to my hotel and spent 2 nights in Brazil’s largest city. [This São Paulo adventure would be in another blog.] I boarded an early Saturday morning flight to Rio de Janeiro. At the airport in Rio, a Brazilian tourist guide, who spoke quite good English enticed me to take his car for R$85. The weariness from the early morning flight easily convinced me to take his services. 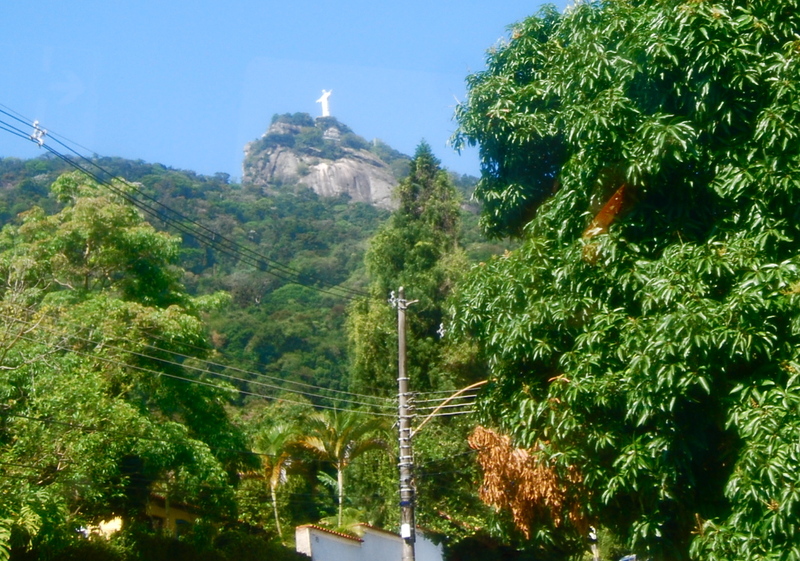 On our way to my hotel, catching the gaze of the Christ the Redeemer statue from up above Corcovado mountain for the first time was my primary goal. 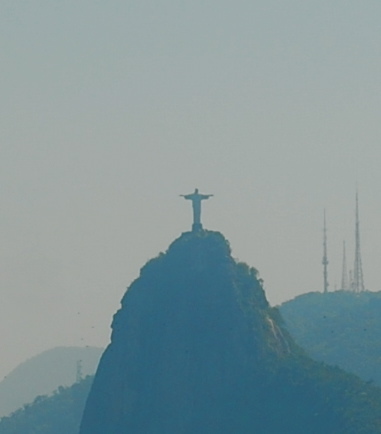 However, I could only capture a distant image of the statue with my camera but it was already an awe-inspiring experience having seen the statue from afar, situated high above the skies of Rio on top of Corcovado mountain. 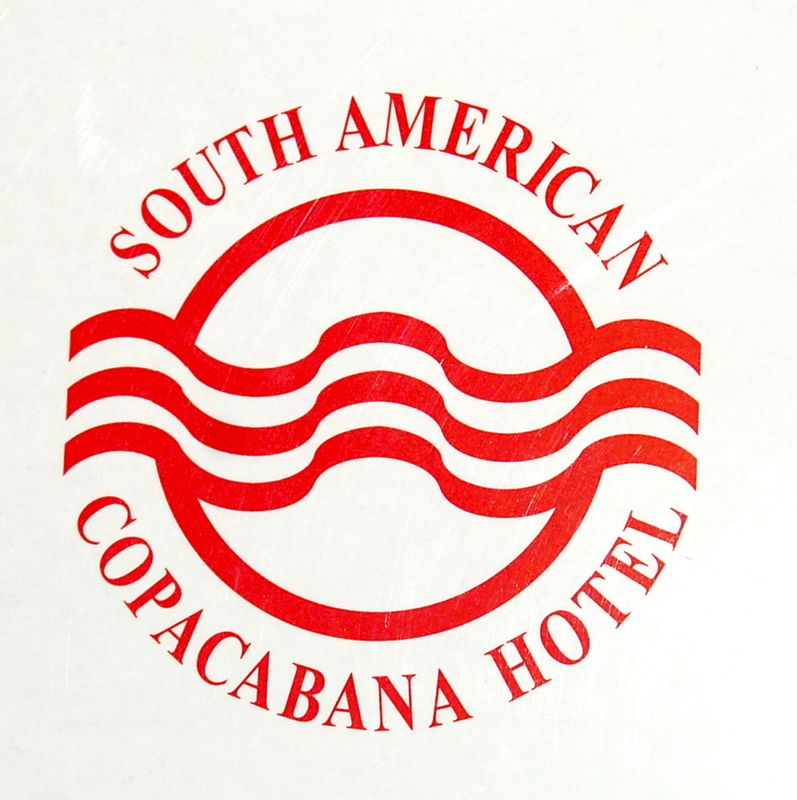 We reached the South American Copacabana Hotel after traveling three quarters of an hour. 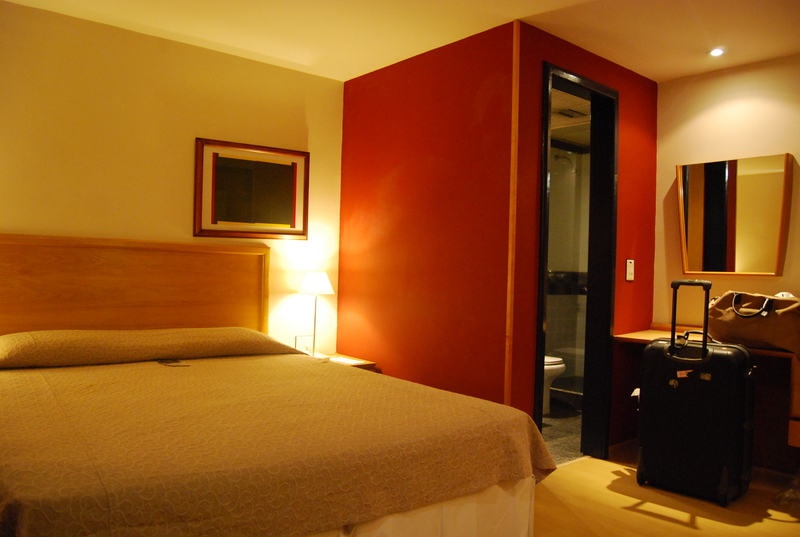 The hotel is a grand old dame with nicely appointed and newly renovated rooms. Internet access is my travel umbilical cord so the free wi-fi accessible anywhere in the hotel premises was my final stamp of approval of my Rio lodging choice; breakfast did not disappoint as well. 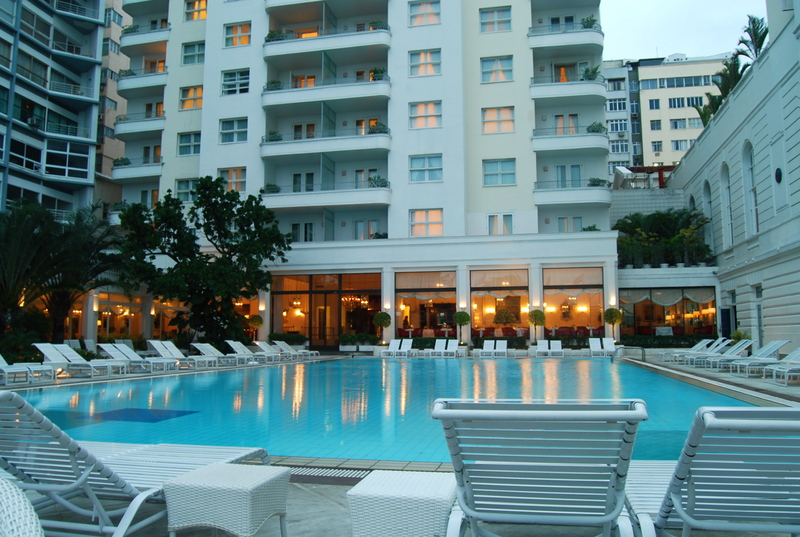 However, the hotel’s most striking asset is its amazing location between the famed beaches of Copacabana (2 blocks away) and Ipanema (4 blocks away). 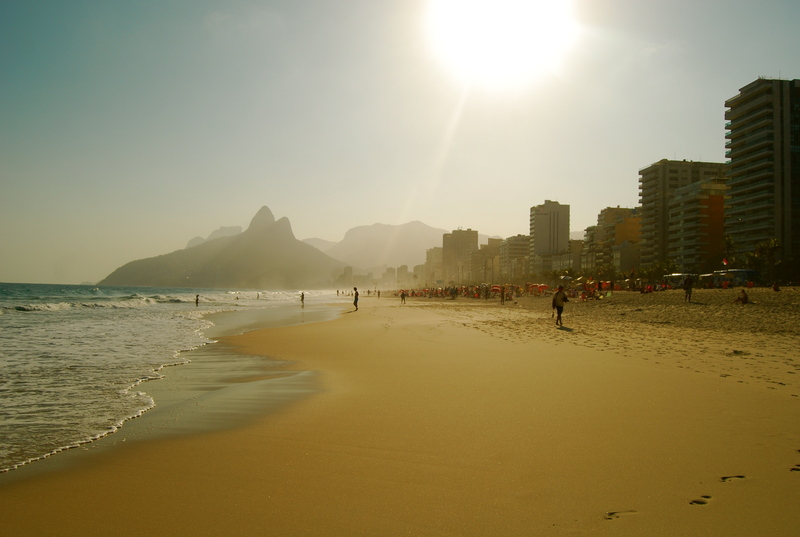 It has been said that if you are in Rio, if you don’t go to the beach, you don’t know anything that is happening. With that, you need easy access to the beach and you have to go to the beach everyday when in Rio. Beaches have become an inherently democratic institutions. After a quick rest I immediately ventured into the streets of Rio passing by a few residential, hotel and business areas to Copacabana Beach just two blocks away from the hotel. 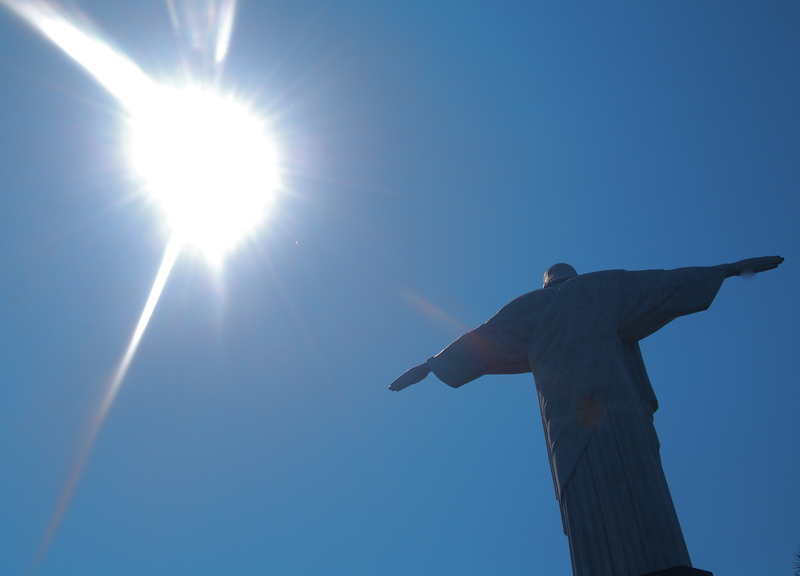 Having a tropical savanna climate, Brazil has a rather mild and forgiving winter. 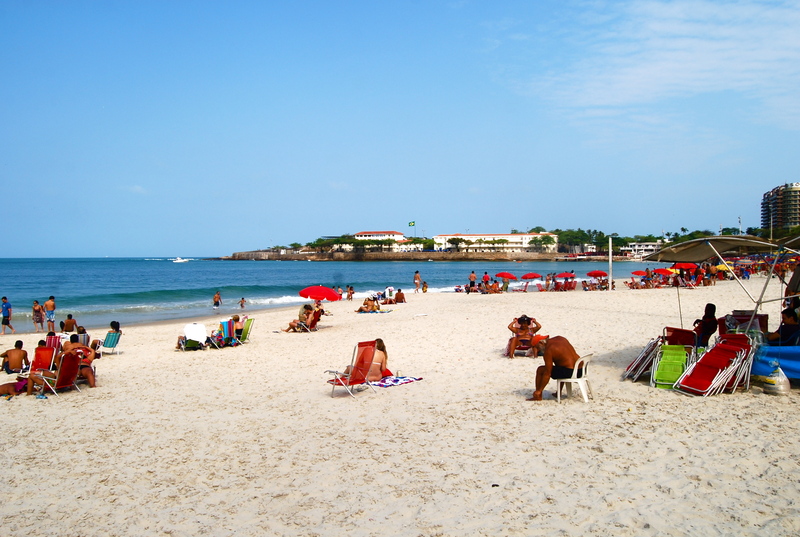 Daytime temperature could only soar to a high of 27°C and drop to 16°C at night so I could still see a lot of Cariocas (locals) dipping in the beaches of Rio. 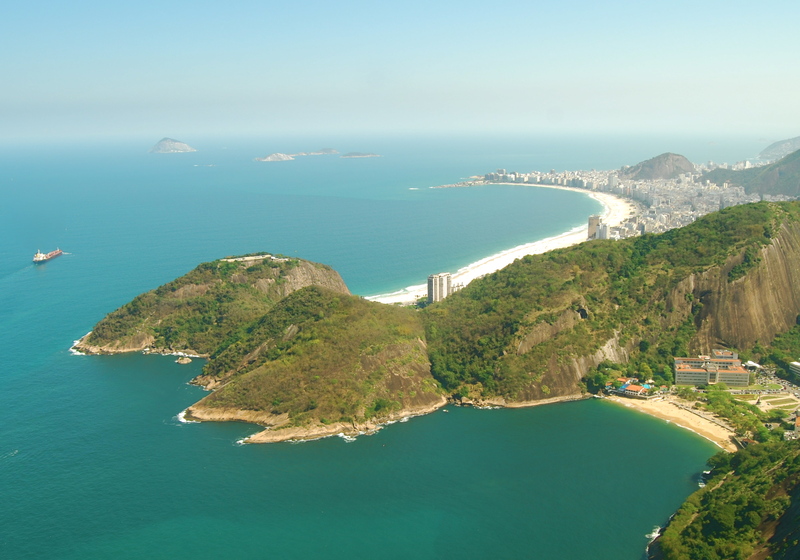 Copacabana’s amazing topography of white sand lines a curving bay with Sugarloaf mountain promontory at its northern end is its distinguishing inherent characteristic. 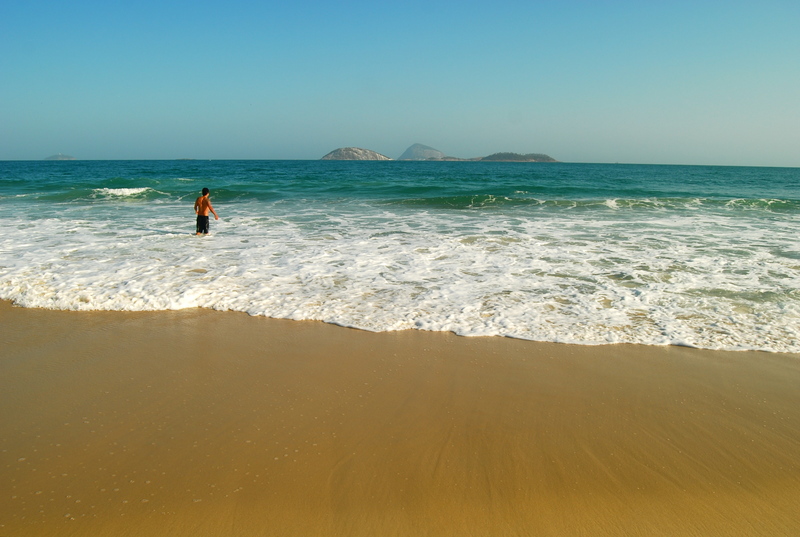 The southern end of Copacabana is quieter and has the impassable cove that separates it from Ipanema. This is where I spent the entire sunny afternoon strolling, taking snapshots of the gorgeous beach and having my first dining experience on a beach in Rio. I committed quite a blunder of placing an order of barbecued beef which I think the humungous portion was good for 5 persons. I did not finish it anyway. 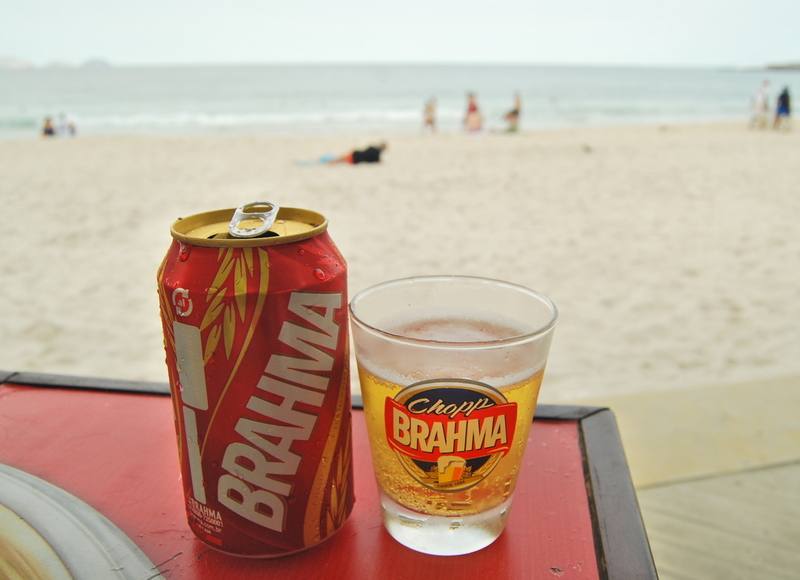 I partnered the beef with Brahma beer that easily became my favorite Brazilian beer. 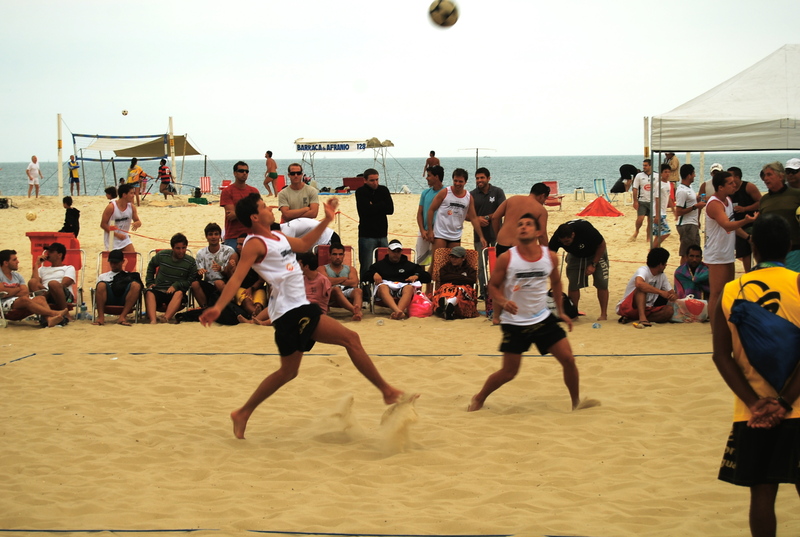 Aside from lazing on the beach, Brazilians are fond of playing on the beach the locally famous footvolley. I could see a net almost every 200 meters or so on the beach. 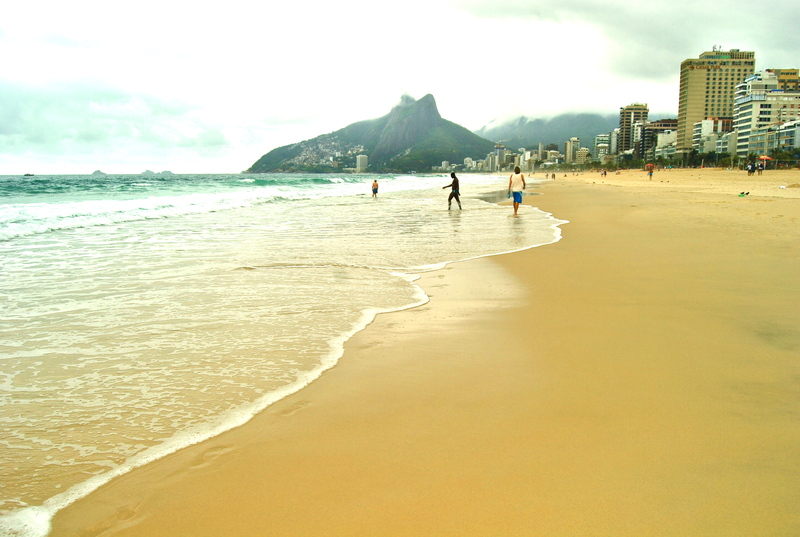 The next day was spent on Ipanema beach. 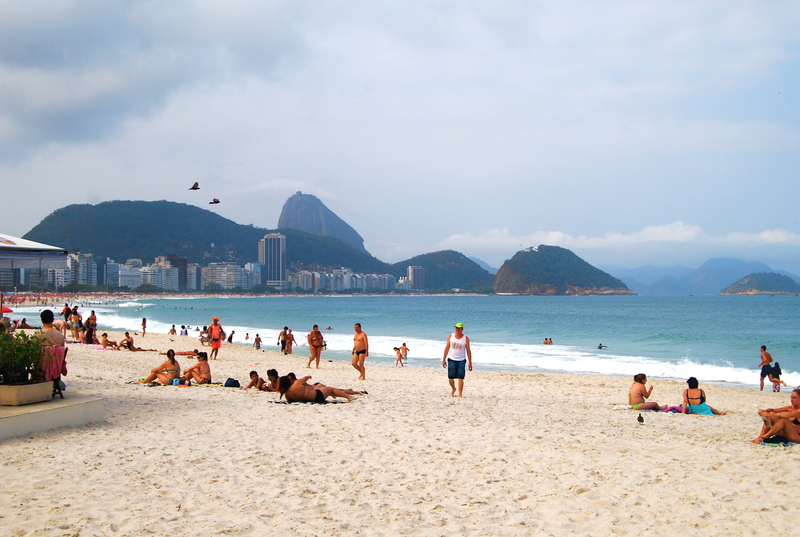 Ipanema’s beach is more subdued and its neighborhood is more affluent than Copacabana’s, however Copacabana has the better curvature and longer coastline. It was a cloudy day but still a number of people braved the cold waters. On the beach, I watched the day passed by, reading a book by Paulo Coelho (a native of Rio). On this day, I met two interesting Cariocas : one was Rodrigo, a Portuguese play writer who studied English and who chatted with me for 15 minutes after he happily obliged to take my shots on the beach with and without the Brazilian flag. 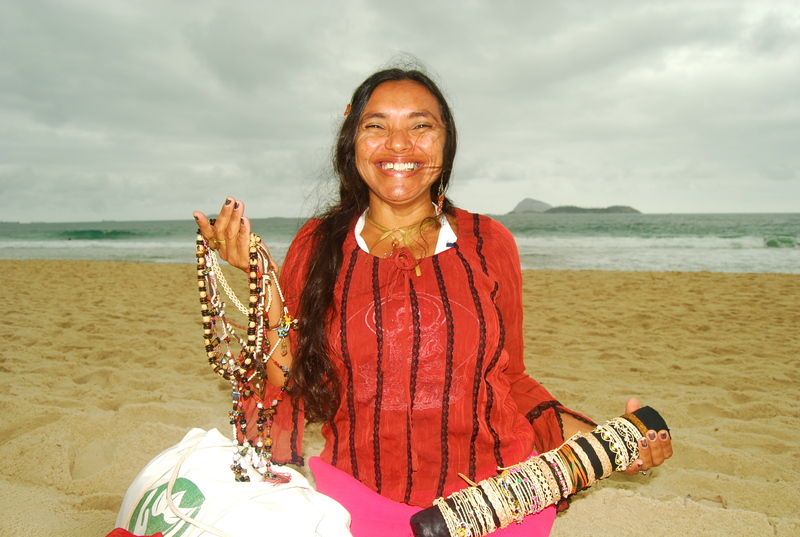 Then came the girl from Ipanema who sold me a buffalo leather bracelet. She could have been the original Ipanema girl who is now retired and enjoying selling goods on the beach that she has been known for. Her English was not faultless but it was forgivable as she was extra pleasing and she had a great smile! Indeed, I could vouch that the Cariocas are a friendly bunch! On the eve of my birthday I rumbled idly once again along Avenida Atlantica, the major thoroughfare running along the entire coastline of Copacabana. The actual coastline layout is, from the left, the beach, the wide beachfront sidewalk, the joggers/bikers lane, the car lanes and the buildings. 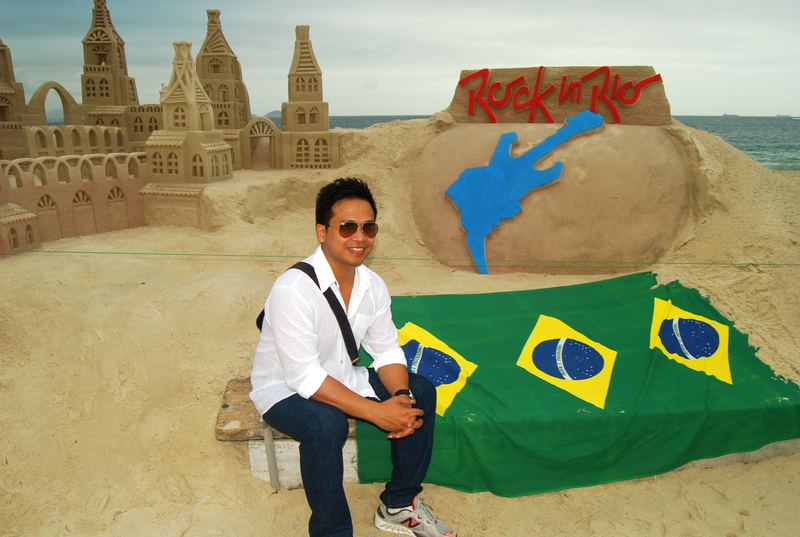 After giving that necessary gratuity to the owner of the Rock in Rio sand-sculpted attraction for that memorable shot, a friendly Brazilian lady, a resident of São Paulo vacationing in Rio, approached me. She warned me not to display large sum of money in public and that was the start of our 15-minute conversation as we walked along the promenade. 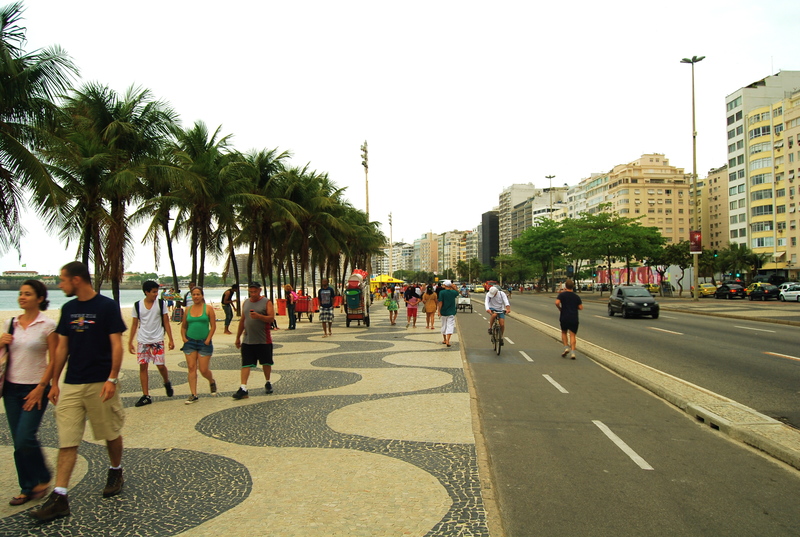 We only stopped chatting as we parted ways as I was on my way to Copacabana Palace, Rio’s most renowned hotel. A vertical Rio landmark, the art deco Copacabana Palace is superbly located along Avenida Atlantica overlooking Copacabana beach. The rich and famous that includes the likes of Fred Astaire, Ginger Rogers, Rolling Stones, the Beatles, Guns and Roses have all stayed here. 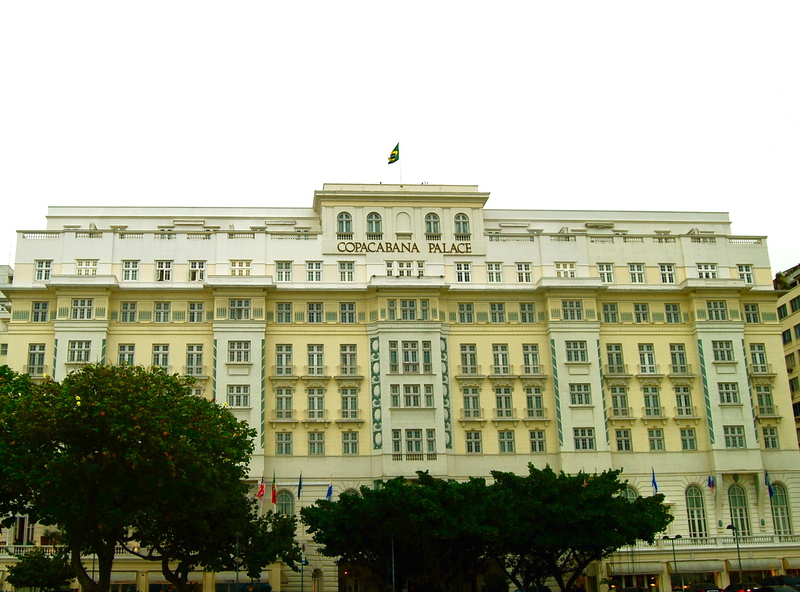 Copacabana Palace’s Pergula restaurant is situated on the left side of the hotel with its terrace facing the legendary Copacabana pool with a classic all-white surroundings and with the air-conditioned area facing Avenida Atlantica and Copacabana beach. 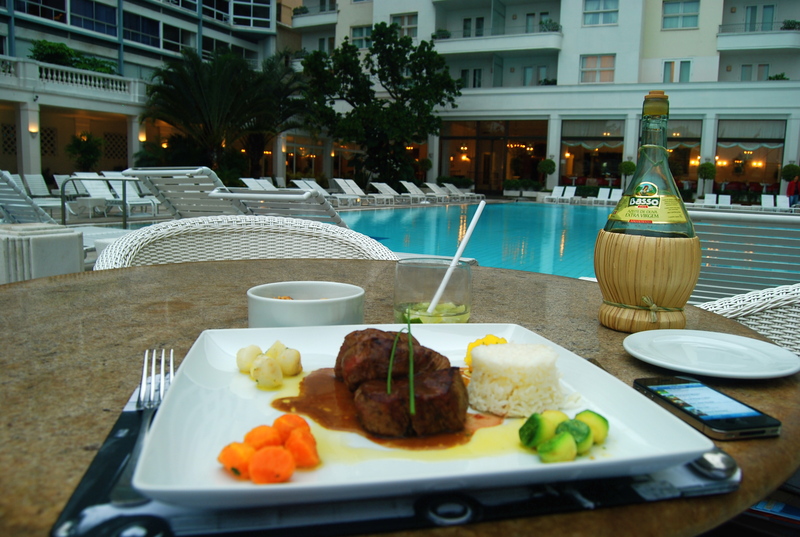 I conveniently positioned myself by the pool away from the main crowd at the restaurant terrace. 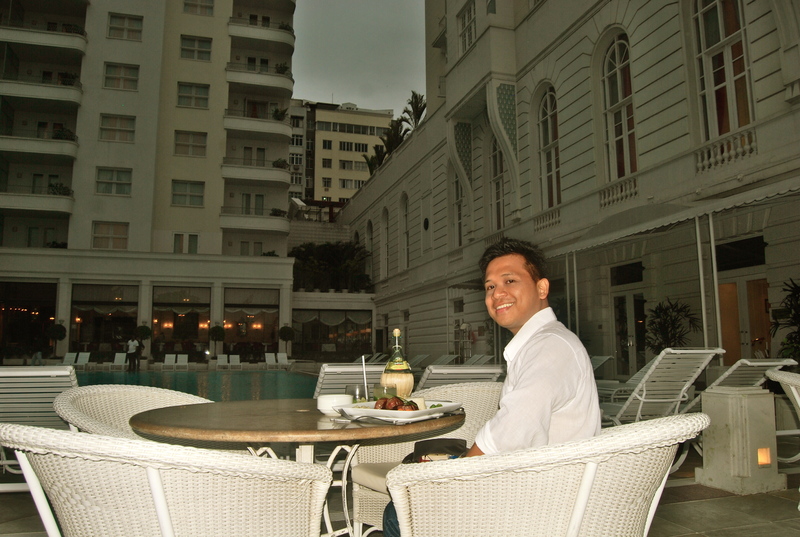 At Copacabana Palace’s Pergula restaurant was where I had my first glass of the famous Brazilian drink, caipirinha, made of lime, sugarcane and cachaca. Was I so delighted or was I just plain alcoholic that I finished three glasses? For my simple pre-birthday dinner I had a filet mignon. 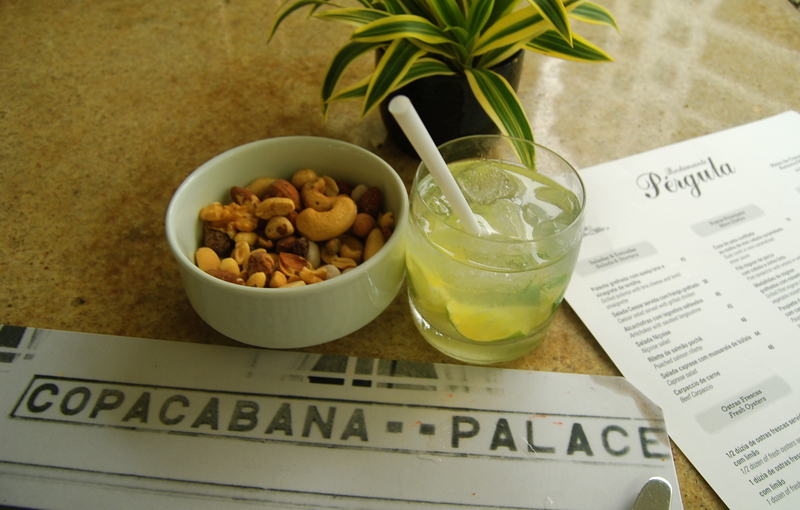 I left the hotel after munching on the steak and sipping those glasses of caipirinha. As planned, I wanted my birthday to be the highlight of my stay in Rio so I joined a group tour to Rio’s top attractions. It was the perfect day for the tour as the sun came out after hiding for two days. I really felt so blessed and I thank my God for the fantastic, sunny birthday. Interestingly, the day after my birthday, the sun disappeared again until I left Rio two days after. 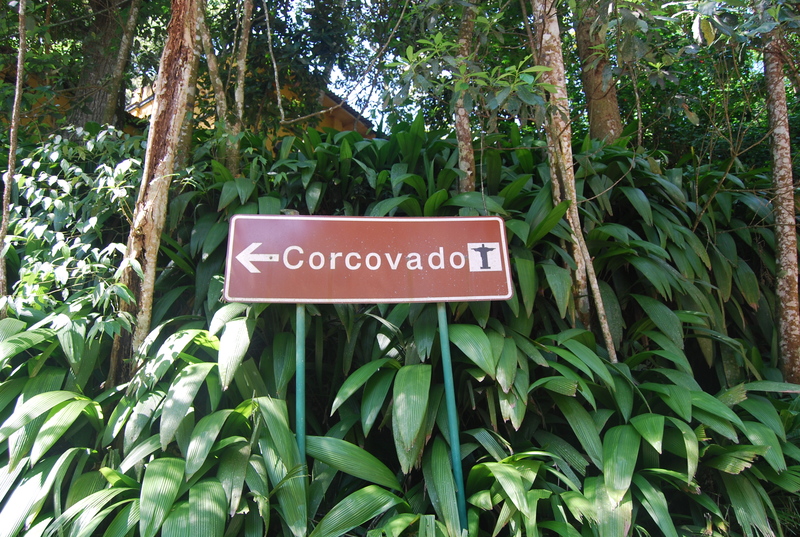 The tour’s first stop was Corcovado mountain. Our tour guide drove us more than halfway to the top of the mountain where only authorized vehicles and drivers could finally fetch visitors for that second leg climb up to the summit. 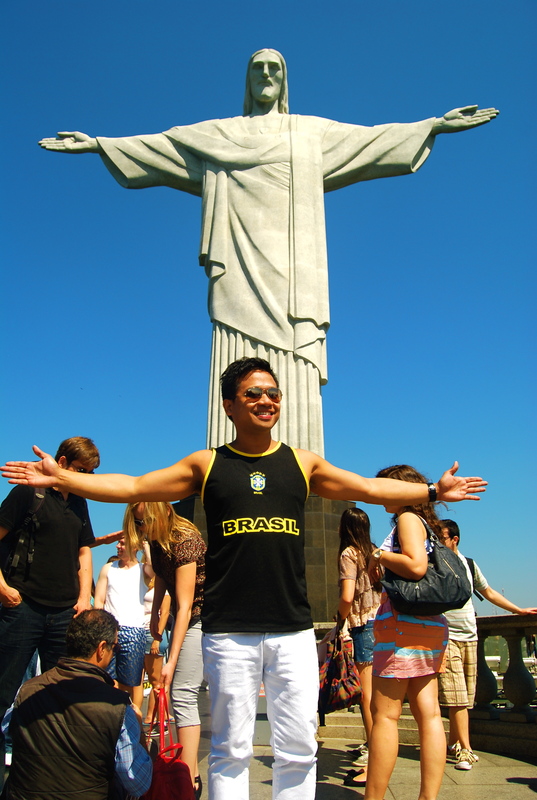 At the peak of the 700-meter Corcovado mountain is the Christ the Redeemer statue (Cristo Redentor in Portuguese) overlooking Rio. The world-famous statue is considered the largest art deco statue in the world and it has become an icon of Rio and Brazil. 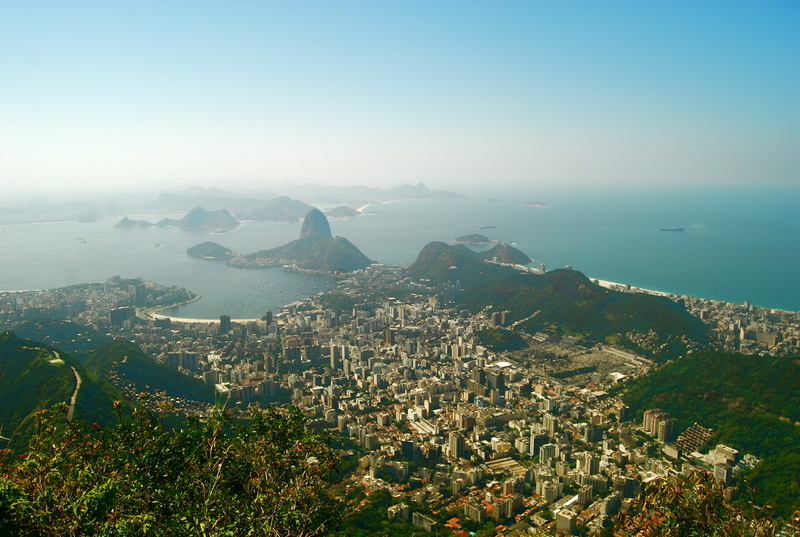 The scene from the mountain summit is indeed breathtaking, with unobstructed views of Rio. Most notable is the stunning view of the Sugarloaf mountain in between the twin coasts of Guanabara Bay (with the beaches of Flamengo and Botafogo) and the side of Copacabana beach. 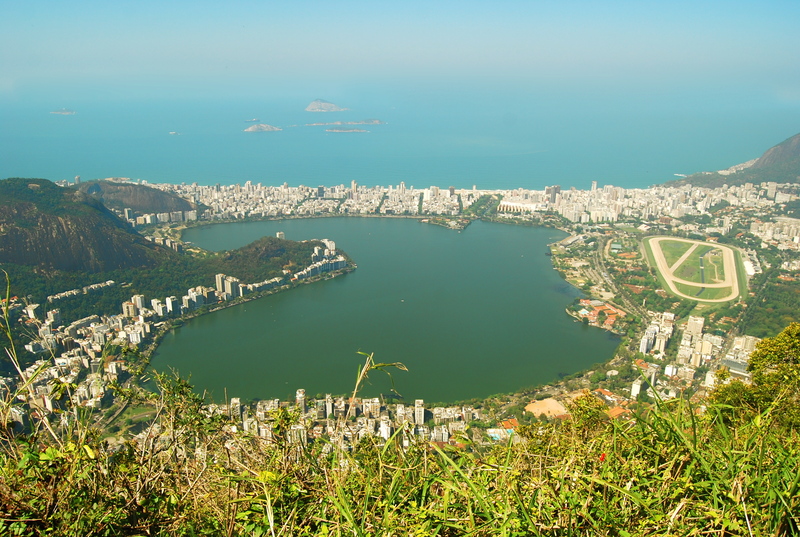 Also from the Corcovado mountaintop, Copacabana and other neighborhoods are visible circling around the Rodrigo de Freitas lake. 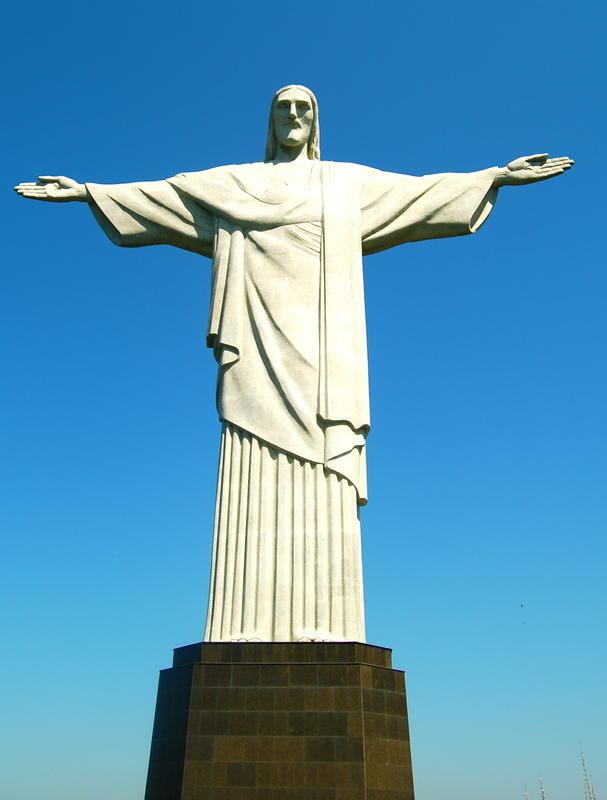 The statue of Christ atop Corcovado mountain is 130ft tall & 30 ft wide. In 2007 it was named as one of the New Seven Wonders of the World by the Swiss-based The New Open World Corporation. We spent 40 minutes on the statue pedestal taking memorable shots and enjoying the breathtaking vistas. Our next tour stop was the city center where we had a brief stop at the Catedral de São Sebastião do Rio de Janeiro. 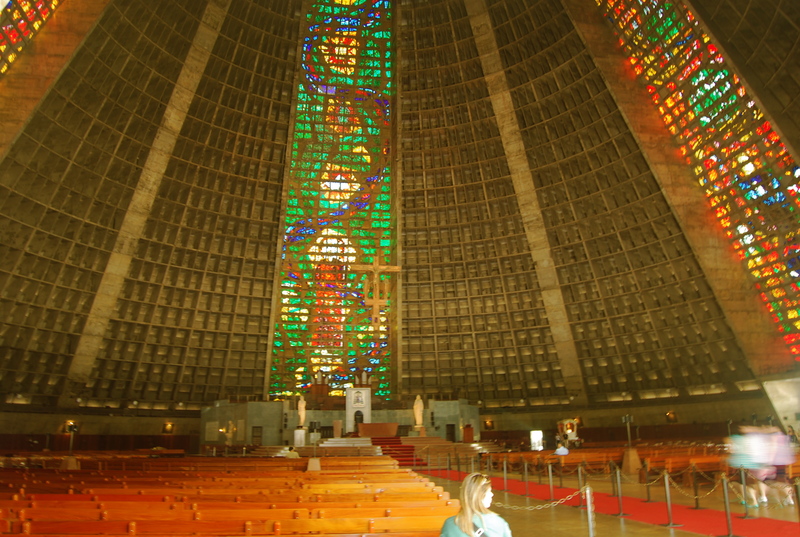 The cathedral is conical in shape with a 315 ft internal diameter and a height of 246 ft. 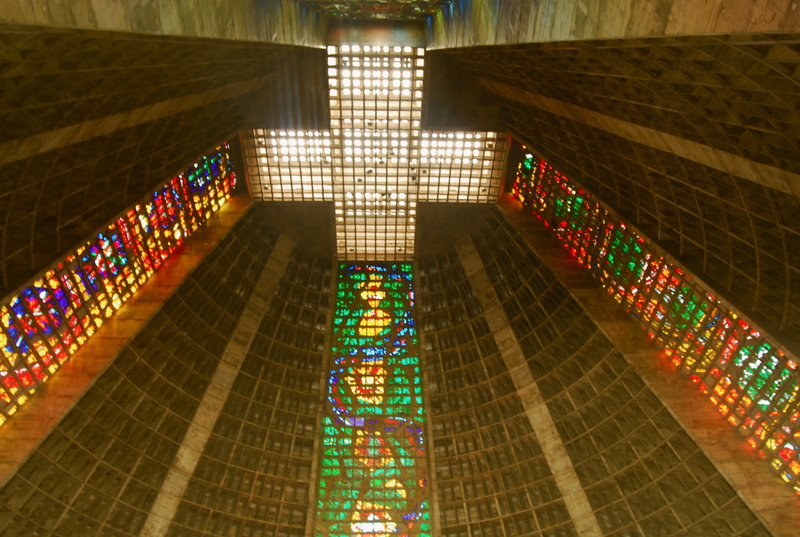 The four rectilinear stained glass windows of the cathedral soar to a height of 210ft. It has a standing room capacity of 20,000. 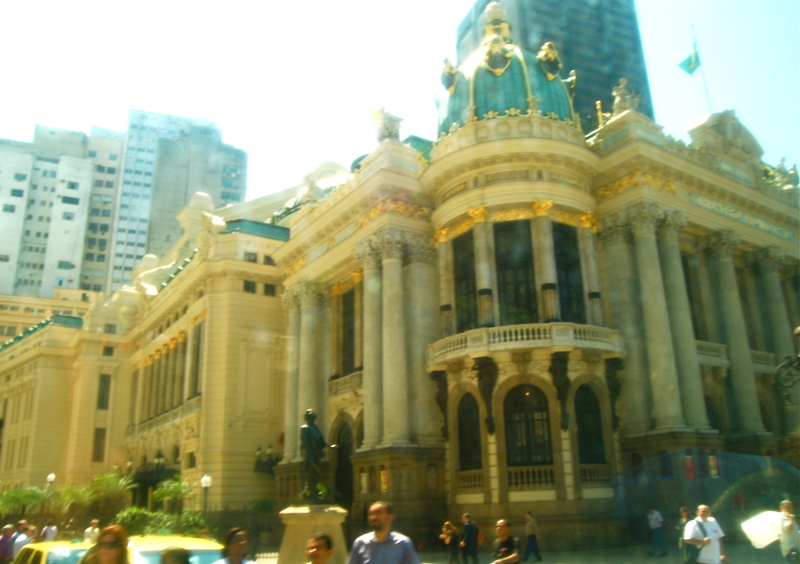 After the 15-minute stop at the cathedral, we roamed around the city center passing by buildings such as the imposing & newly renovated Theatro Municipal do Rio de Janeiro. Then we continued on and briefly stopped at the empty Sambadrome where samba schools parade competitively each year during Carnival. 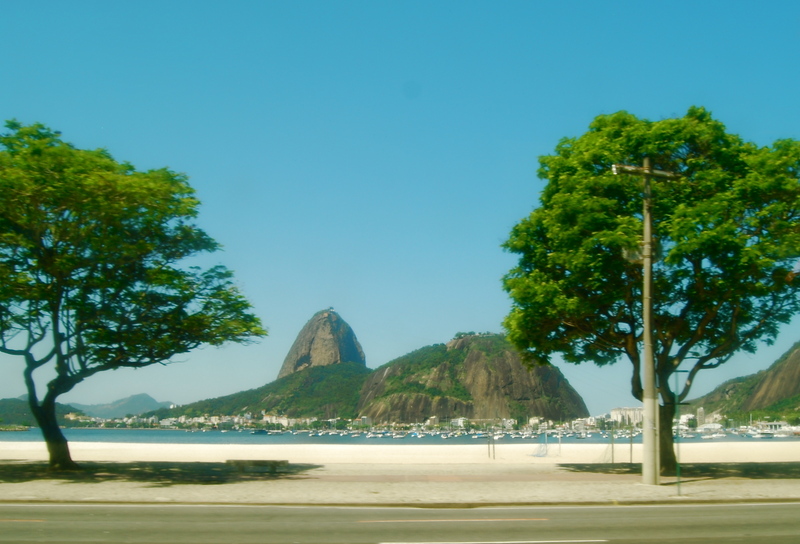 Then we proceeded to our last tour stop, Sugarloaf mountain, passing by the gorgeous Botafogo beach. We arrived at the grounds of the entrance to Sugarloaf mountain just past mid-noon. 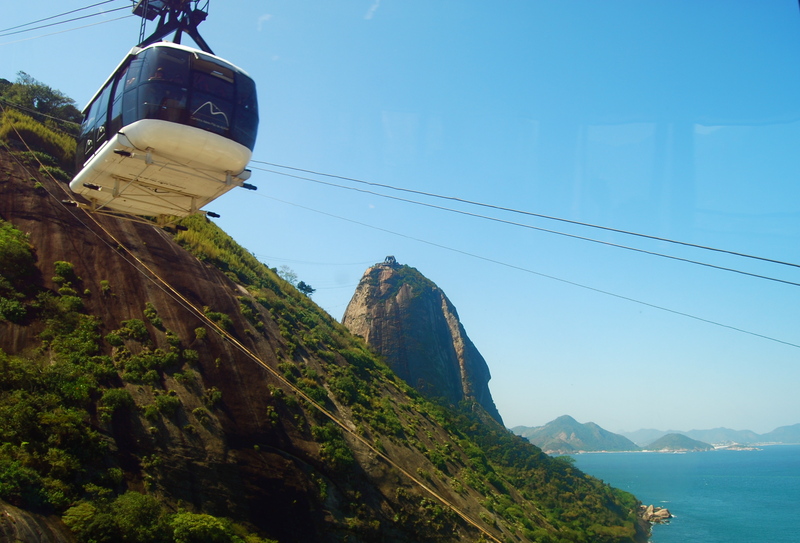 To reach Sugarloaf mountaintop, we had to take a two-leg cable car ride. 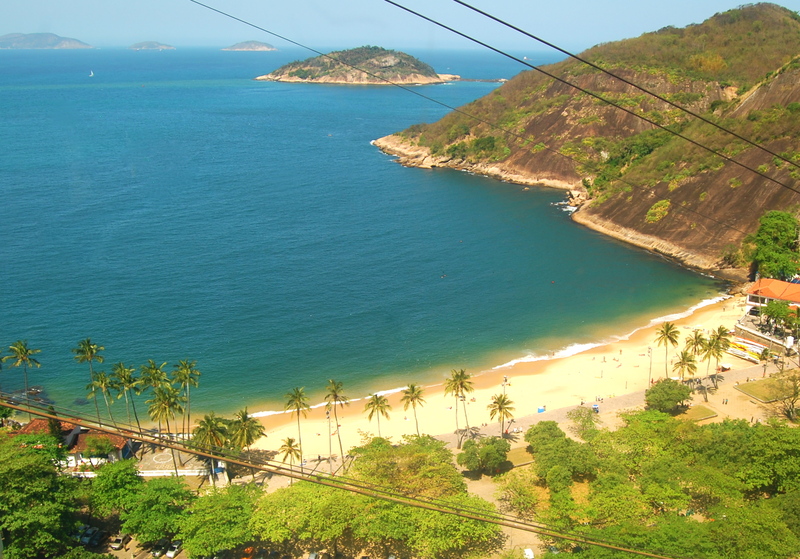 The first leg of the cable ride offered a dazzling top view of the nearby Velmena beach. 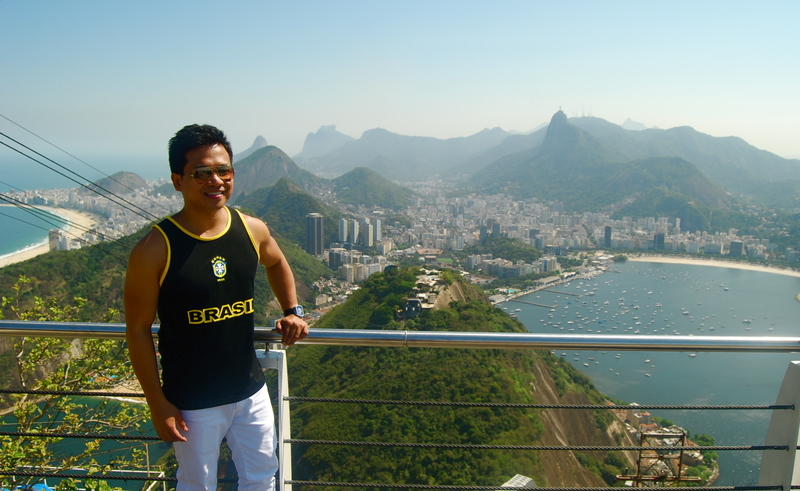 At the top of Sugarloaf mountain, I was absolutely blown away by the 360° views of Rio. 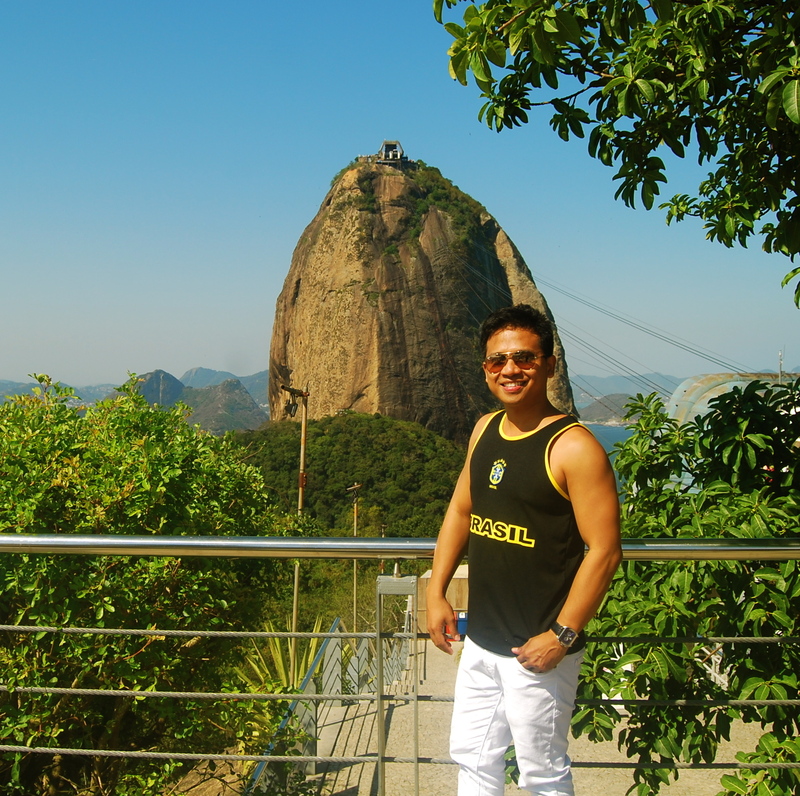 I liked the scenery here compared to the one in Corcovado mountain. The beaches are more visible from here: to my left is Copacabana, to my right is Botafogo on Guanabara Bay. Most importantly, from the Sugarloaf mountaintop, there is the distant view of Cristo Redentor crowning Corcovado mountain, the highest peak as seen from this vantage point. 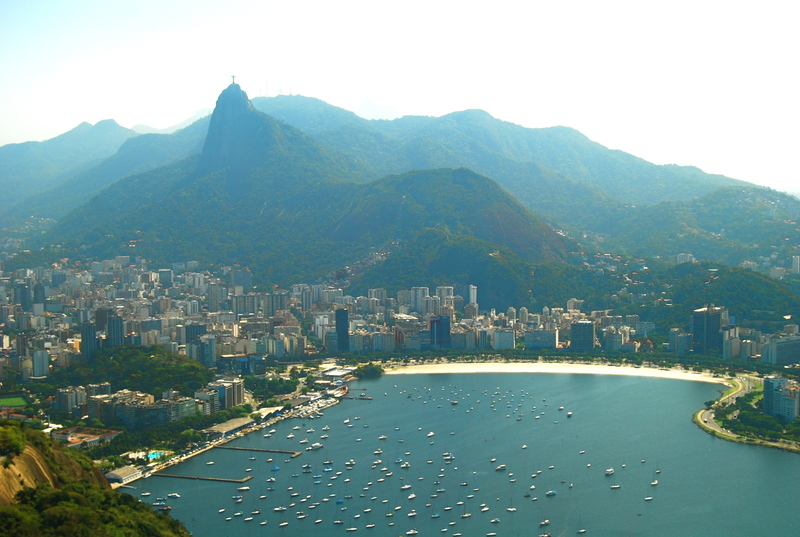 Also from the top, Guanabara Bay sizzles with Botafogo and Flamengo beaches and with the city center’s skycrapers and the rugged, abrupt mountains serving as backdrop. Tilting views from Guanabara Bay to the south, the legendary Copacabana beach can be seen with its perfect curve of blindingly white sand. 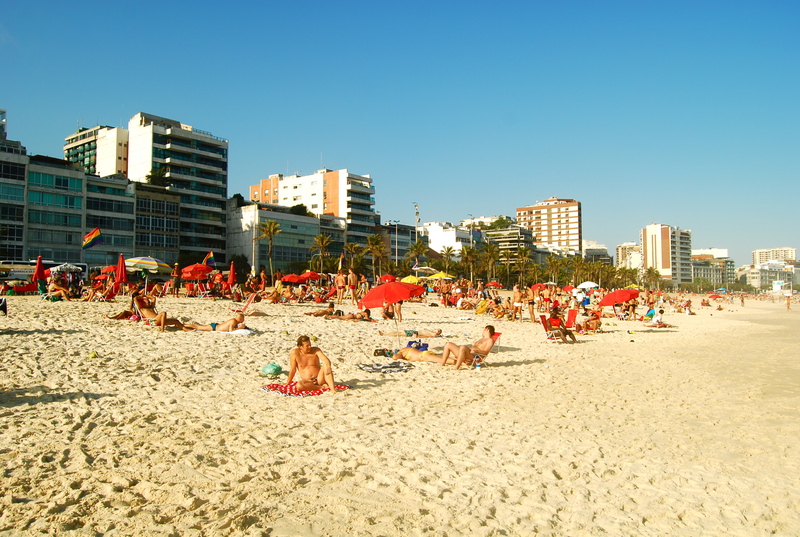 The shorter, golden beach of Velmena is also visible. 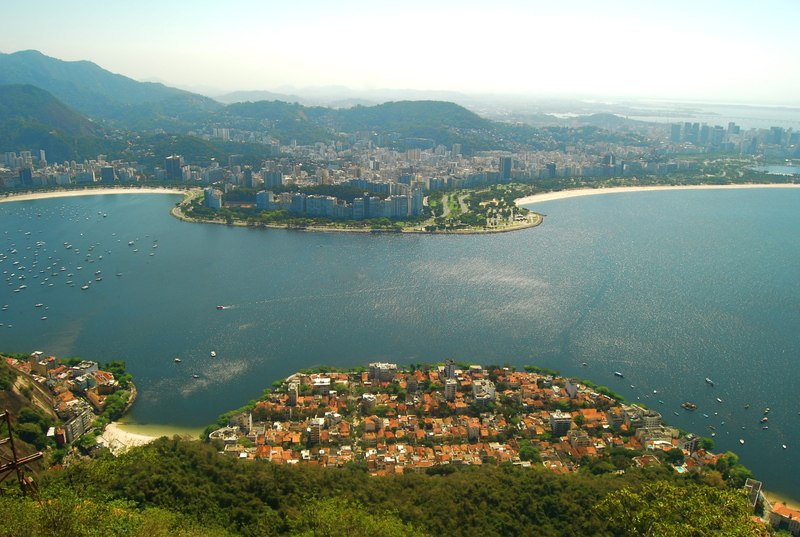 This is a closer shot of Copacabana beach from the top of Sugarloaf mountain. 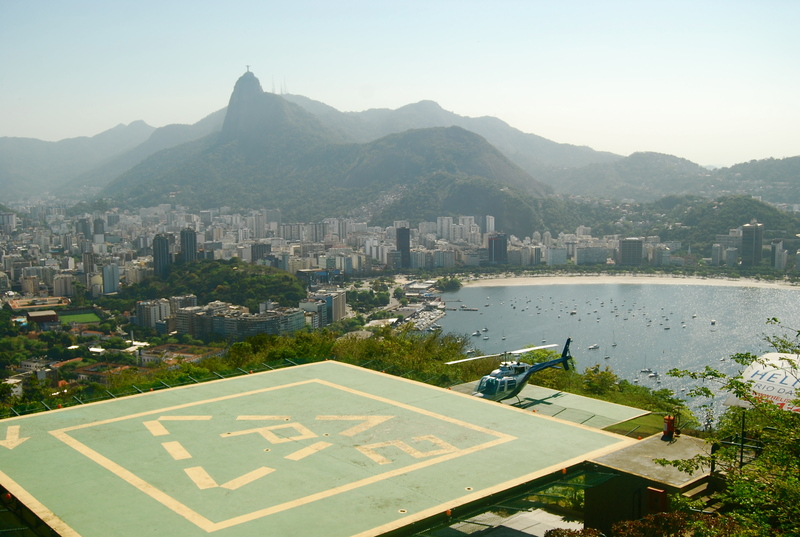 Helicopter tours depart from the jumping-off point to the second and final cable car ride to Sugarloaf mountain. 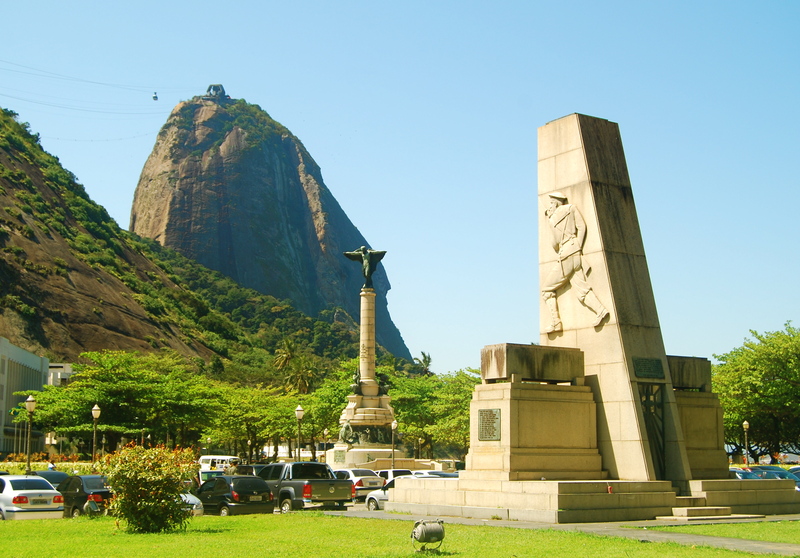 The cheapest tour is around R$180 that includes flying lowly over Copacabana beach and then on to Corcovado mountain up high to closely view the Cristo Redentor. 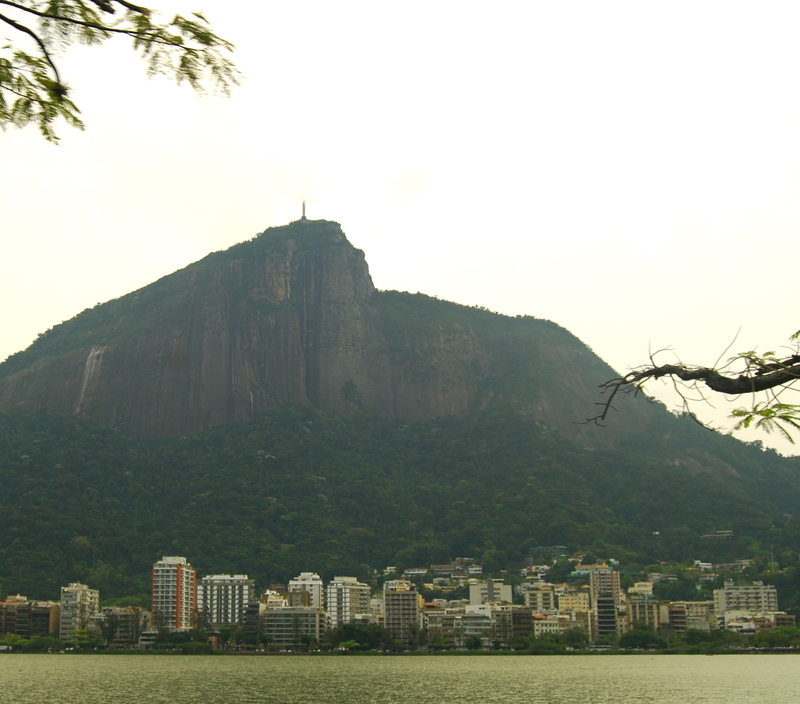 From this vantage point, I had the best of Rio’s twin bulging attractions, the Sugarloaf mountain and the farther Corcovado mountain with the statue of Christ. There was no better way to spend my birthday than feasting on the postcard-worthy views up high above Rio stunned by its great natural wonders: the dazzling white sand beaches, the towering granite mountains, the rain forests and all. The tour finished around mid-afternoon and I went back to the hotel for a short rest. 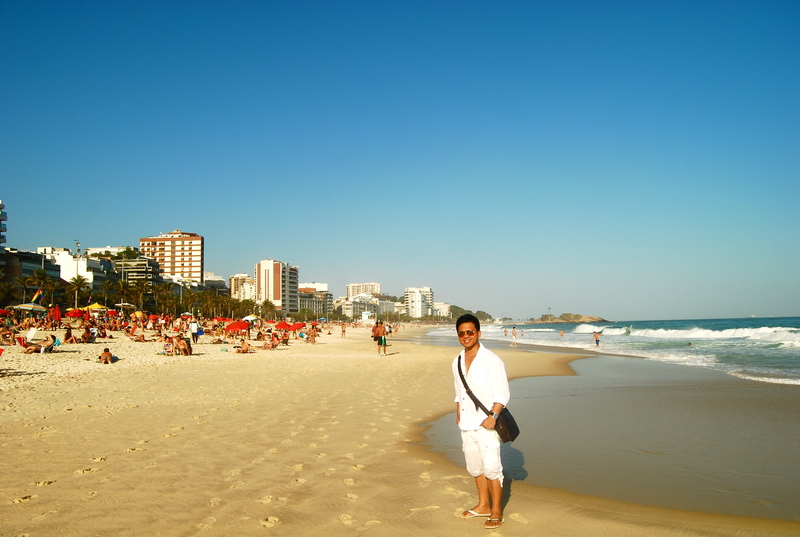 I spent the rest of the sunny afternoon strolling again on Ipanema beach where there were a lot of …………. Ipanema’s distinct view includes the island mountains off Atlantic Ocean just opposite it. The water was too cold for me to dip in and the sun was too hot for me to sunbathe so I just strolled along the beach and had someone took my souvenir shot. 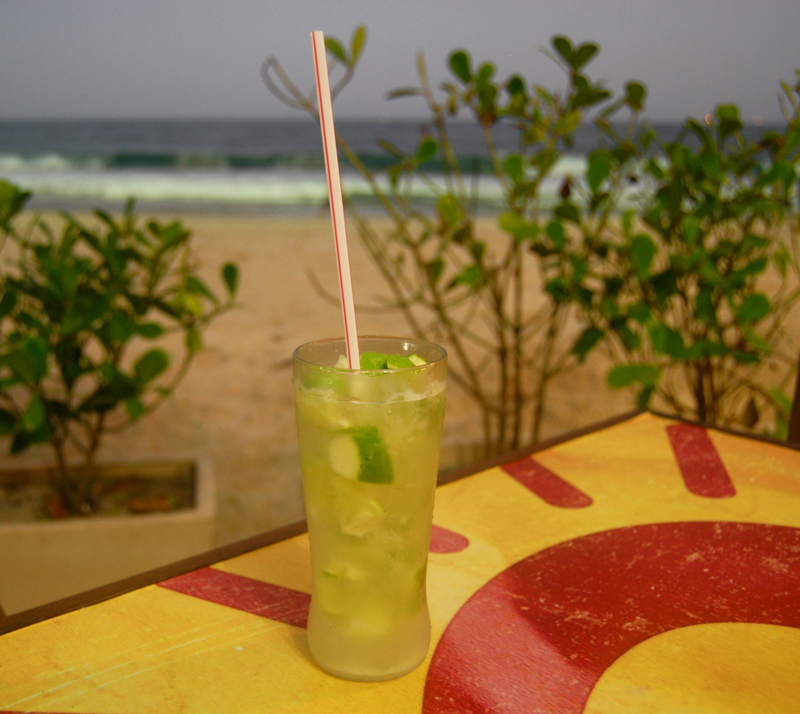 I capped the day with a sip of caipirinha (again!) 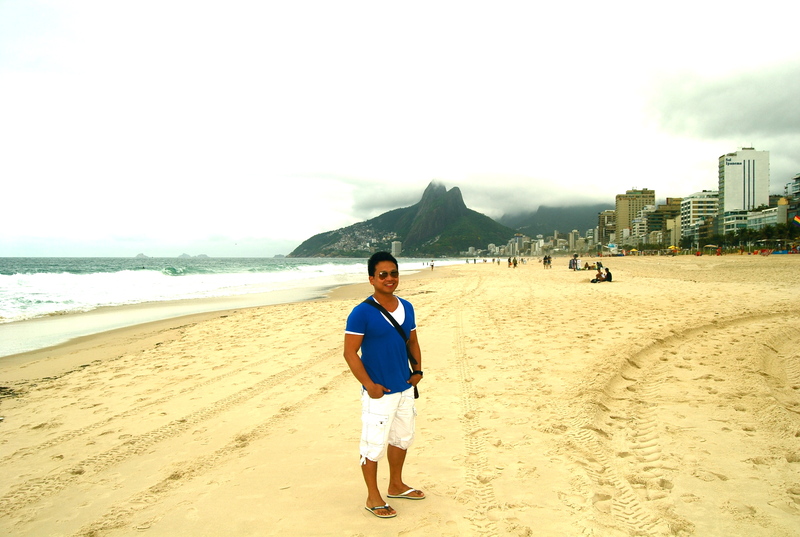 on Copacabana beach. Interestingly, on that day, almost 430 kilometers away, the Miss Universe 2011 pageant was being held in São Paulo. I spent the night watching the event live on TV that ended with the Philippine bet, Shamcey Supsup, garnering a decent top 4 finish. I believe this trip would be a start of a series of visits to Rio. I have experienced Rio at its quietest season and hopefully I would want to alight upon its most colorful and loudest, the time for the world’s greatest party the Carnival! 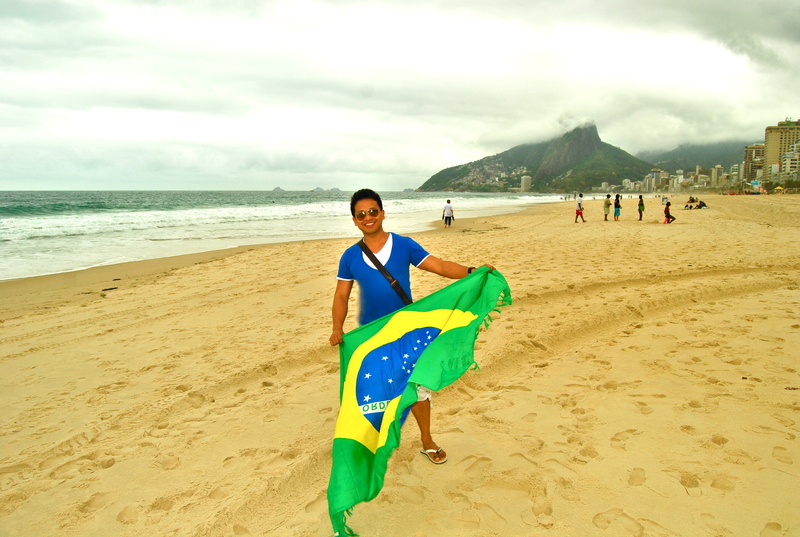 I would be back soon, Rio! Missed out #1: Favelas. If the city’s privileged live on the flat areas of Rio near the beach, then the hills that punctuate those areas are where the poor people live and they are called favelas. Samba evolved in the favelas and new funk music too. Some Brazilian soccer stars and famous models also came out of the favelas. As a tourist you may or may not choose to visit one of those steep favelas. I chose not to for security reasons even if I wanted to and there are tour groups going up to those places. Missed out #2: Barra. 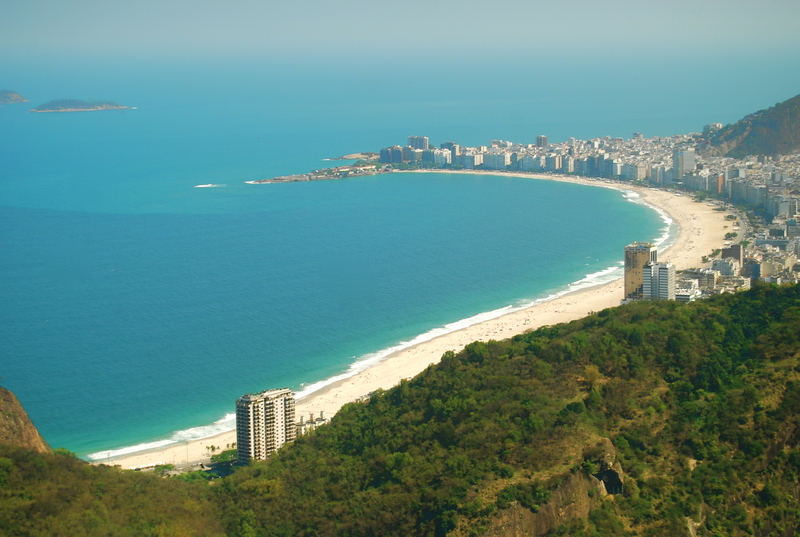 It is Rio’s fastest growing suburb that is bordered by the city’s longest beach, Praia da Barra da Tijuca, that stretches 11 miles. Barra also has Latin America’s largest shopping mall, the Barra Shopping Center. This is surreal! You make me want to include Rio in my bucket list!!! Thank you for sharing with us your travel and adding more essence into it through this blog. Hi Romana…yes more blogs coming up….Mexico and Egypt next and more, more, more. They have been delayed but better late than never! Thank you for the encouragement! Yes, I really felt posting the pictures with some captions in FB will not really express fully of what I felt during my travel. And God willing, more travels!!!! Beautiful travelogue Erwin! Keep writing! 🙂 South America remains a dream for now but one day we hope to visit Brazil! Maybe with you :)) Why not?! yeah Djae. let us go during Carnival!! WOW and WOW! you can write… I was just wondering if you had gone to any of the Foursquare church there, it would make this journey complete for me. What I have been wanting to see in Brazil is the booming growth of the foursquare church. Brazil has the biggest and fastest growing Foursquare church in the world. Well, again that all depends on what is nearer to your heart. 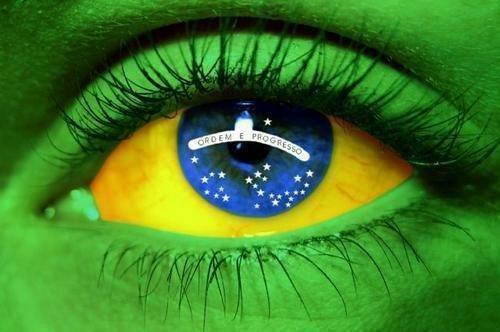 As a child I have been always fascinated by the flag of Brazil that every united nations day in school, I would choose to draw the same flag every year. For one thing, Brazil is my favorite football team, I remember the last time they won the worls cup, they really poured out their thanksgiving to God knowing that millions of people around the globe are watching. Win, keep documenting your journey with God as this is what will last. Sorry, if I keep reminding you but make my word, if you finish the book… it will be read and re read and the message will remain because it is the work of God. Years will pass and people will still be reading it. Be encouraged… pick up the pieces and write what God has done. God blessssss you and your work . Hi Pastora, thank you for the appreciation and all the advices. Anyway I was not able to check out on the church there. Yes, I remember that moment when they won the World Cup. We talked about it afterwards! Yes, I am the more encouraged to finish that book. If I could document all my travels, why could I not document the things that God has done in my life and in others that’s relevant to the main topic of the book! All the glory to Him who gives us wisdom, knowledge and strength in everything that we do! Thank you again! Yes, congratulations!!! This is really a two thumbs up for me, very informative, with nice pictures that depict not only the places you have been there but also to the writer. This is indeed a real documentary! Just keep on writing while you travel. We are very proud of you! Thank you Rodele for the appreciation. I hope I was able to share my joys of traveling even in these travel blogs. Hello Webmaster, I noticed that https://winairtravel.wordpress.com/2011/10/01/rio/ is ranking pretty low for some keywords, this may be due to the new Google Panda update, or it could be due to a variety of other factors. I’m sure you already know about On-page SEO, where Google cares highly about proper formatting of various H1/H2/H3 tags, having your main keyword appear in the beginning of your post and having your post end with the keyword, along with having keyword related alt tags and very relevant LSI. However, you do not seem to have the proper Keywords or relevant Keywords in your posts and in the website. Right now you need a tool or plugin that will allow you to check on Keyword insights, search trends and check for backlink analysis and to find out your Keyword competition. To find a Keyword Plugin that combines both Keyword Research and has the ability as a Rank Checker is what WordPress Seo Keyword, please check out our 5 minute video. Pretty portion of content. I simply stumbled upon your web site and in accession capital to assert that I get actually enjoyed account your blog posts. Anyway I’ll be subscribing in your augment and even I fulfillment you get right of entry to persistently fast. Hi! This post couldn’t be written any better! Reading this post reminds me of my good old room mate! He always kept chatting about this. I will forward this write-up to him. Pretty sure he will have a good read. Thanks for sharing! Hi, thank you for pointing that out. I am using Safari so I would not know. Anyway I will check on it using my brother’s laptop using IE. Again many thanks for the feedback! thank you for your appreciation, Garry! I wish for you to understand some thing in the start of this record knowning that something are these claims: We care about your needs i truly imply. I think this website contains some real fantastic information for everyone. “Few friendships would survive if each one knew what his friend says of him behind his back.” by Blaise Pascal. wow! well written.. makes me want to visit brasil in 2016 for the world cup and see the beautiful country! or see the carnivale with you! Seems you really had loads of fun! Hiya, I’m really glad I have found this info. Today bloggers publish only about gossips and internet and this is actually frustrating. A good site with interesting content, this is what I need. Thank you for keeping this web site, I’ll be visiting it. Do you do newsletters? Can’t find it. 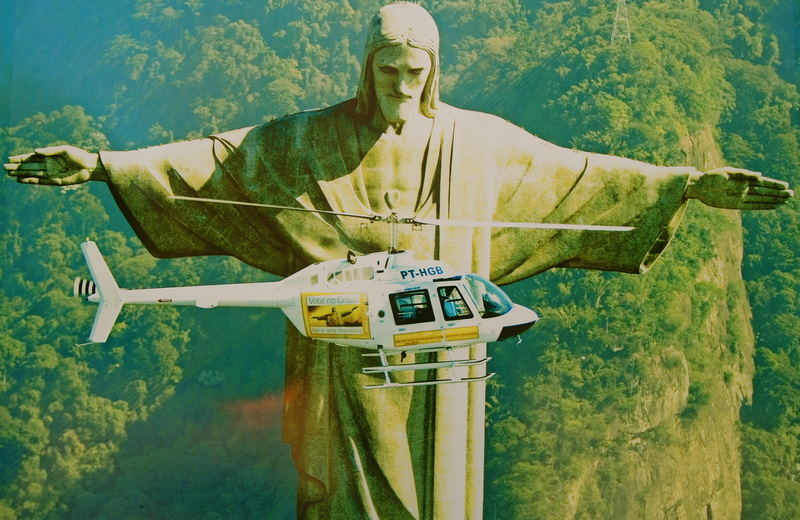 Great job writing Brazil : Rio de Janeiro winairtravel. I’d like to read more about this subject. Sup. Just would like to give a brief note and question where you acquired your web graphics I might be beginning own web-site and honestly really like your particular model. You made some respectable factors there. I regarded on the internet for the problem and located most individuals will go along with with your website. You need to participate in a contest for among the very best blogs on the internet. I will suggest this internet website! Thank you, I have recently been seeking for details about this subject for ages and yours is the best I have found so far. Thanks for another wonderful article. Where else could anybody get that kind of information in such an ideal way of writing? I’ve a presentation next week, and I’m on the look for such info.